As nuclear waste will remain radioactive for millions of years, how can it be kept from causing harm to people and the environment? It is not an easy task. However, Rutgers researcher Ashutosh Goel has found ways to immobilize such waste - resulting from decades of nuclear weapons production - in ceramics and glass. Goel, an assistant professor in the Department of Materials Science and Engineering, is the primary inventor of a new technique to immobilize radioactive iodine in ceramics at room temperature. He is also the principle investigator (PI) or co-PI for six glass-related research projects that have been awarded $6.34 million in private and federal funding, with $3.335 million allocated to Rutgers. 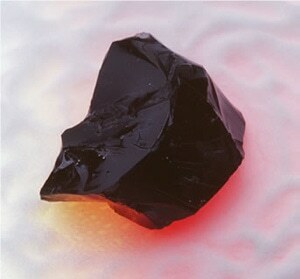 Glass is a perfect material for immobilizing the radioactive wastes with excellent chemical durability. Iodine-129 is especially difficult to immobilize, therefore developing ways to immobilize it is critical for its secure storage and disposal in underground geological formations. According to the U.S. Environmental Protection Agency, iodine-129 has a half-life of 15.7 million years, and it can disperse quickly in water and air. Iodine will linger for millions of years if released into the environment. Iodine affects the thyroid gland and can increase the chances of developing cancer. Among Goel’s key funder is the U.S. Department of Energy (DOE), which manages one of the largest nuclear cleanups in the world resulting from 45 years of manufacturing nuclear weapons. According to the DOE, at one time the national weapons complex had 16 main facilities that spanned vast areas of Nevada, Idaho, Tennessee, South Carolina, and Washington. The DOE states that the Hanford site in southeastern Washington, which produced over 20 million pieces of uranium metal fuel for nine nuclear reactors near the Columbia River, is the most challenging one to cleanup. About 110,000 tons of fuel from the reactors was processed from the Hanford plants. About 56 million gallons of radioactive waste (which can fill over 1 million bathtubs) ended up in 177 large underground tanks. The DOE says around 67 tanks may have leaked. The liquids from the 67 tanks have been pumped out and only dried solids remain. This cleanup effort began in 1989. About 10 years later, construction of a waste treatment plant for the liquid radioactive waste in tanks was started, and about three-fifths have been completed. What we’re talking about here is highly complex, multicomponent radioactive waste which contains almost everything in the periodic table. What we’re focusing on is underground and has to be immobilized. Goel, a native of Punjab state in northern India, received his doctorate in glasses and glass-ceramics from the University of Aveiro in Portugal in 2009. He also worked there as a postdoctoral researcher. He worked at a “glass scientist” at the Pacific Northwest National Laboratory in 2011 and 2012, and then as a senior scientist at Sterlite Technologies Ltd. in India before joining the Rutgers faculty in January 2014. The six projects Goel is leading or co-leading are funded by the DOE Office of River Protection, National Science Foundation and Corning Inc., with partners from Washington State University, University of North Texas and Pacific Northwest National Laboratory. Large-scale production of chemically durable apatite minerals, or glasses to contain iodine without using high temperatures is one of his inventions. Another novel concept involves deploying synthesizing apatite minerals from silver iodide particles. Goel is also involved in analyzing how to contain alumina and sodium in high-level radioactive waste in borosilicate glasses that resist crystallization. The research could eventually pave the way for safe disposal of extremely radioactive spent nuclear fuel that is currently stored at commercial nuclear power plants. It depends on its composition, how complex it is and what it contains. If we know the chemical composition of the nuclear waste coming out from those plants, we can definitely work on it.